I hadn't been to a hamfest (or radio rally as such events are known over here) for several years. 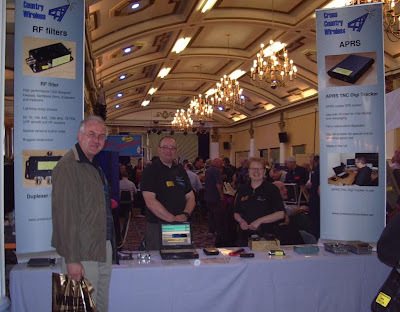 On Friday I mentioned to Olga that the Northern Amateur Radio Societies Association Amateur Radio, Computer and Electronics Exhibition was being held at Blackpool on Sunday and it was supposed to be quite a good one and she said "why not go?" I then suggested that we book a hotel for the Saturday night so we could travel down the day before and see some of the sights of Blackpool, which neither of us had been to before. So we did. The sights of Blackpool served only to help me understand why most Brits these days go to Spain for their holidays, but the NARSA Exhibition lived up to its reputation and was well worth the trip. I spent very little but came back with a large bundle of components most of which I will probably never use, plus an apparently unused Motorola Radius GP 300 handheld, sans battery, which I was unable to resist as the price was £1. It was also nice to meet in person several people I had previously only worked on the air, exchanged emails with or who were readers of my blog. It's impossible to give a full picture of an event this size so I'll just mention a few of the stands that were of particular interest. 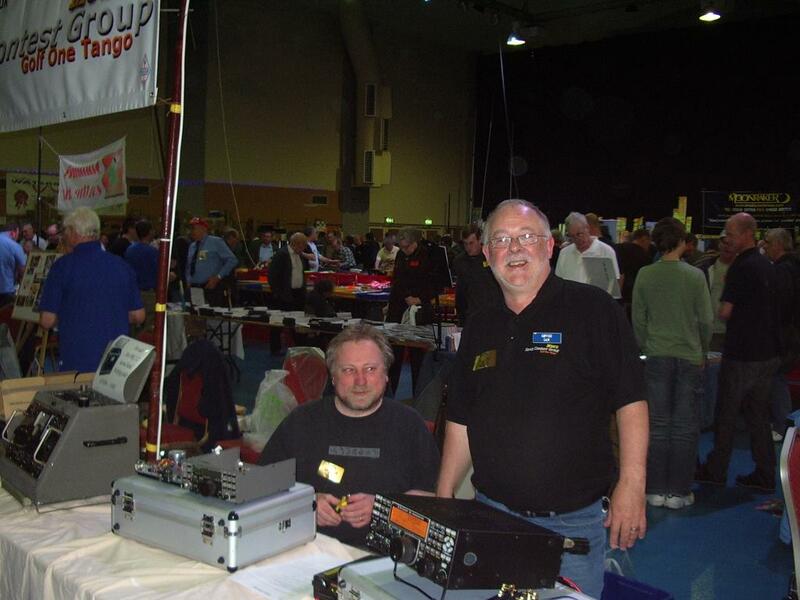 Occupying a prime position right by the entrance was the stand of Cross Country Wireless run by Chris G4HYG and his XYL. He was displaying the new end-fed antennas I mentioned a couple of days ago, as well as his well-established APRS products and the new program APRS Messenger. Chris commented that the number of visits to his site increased noticeably after I'd mentioned the antennas in my blog - hopefully he got some sales as well! Ian G0VGS and Kev G6FKE were manning the Sands Contest Group stand and also giving visitors a chance to look at the K2 and K3 transceivers by Elecraft. 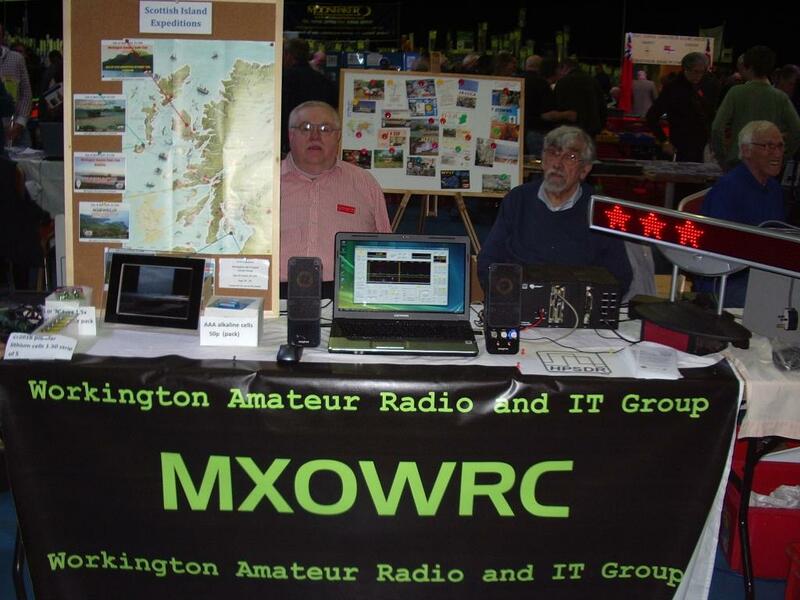 My local club, Workington Radio Club is a NARSA member and had an impressive stand, manned in this picture by Barry G0RZI and Tony G1OAE. 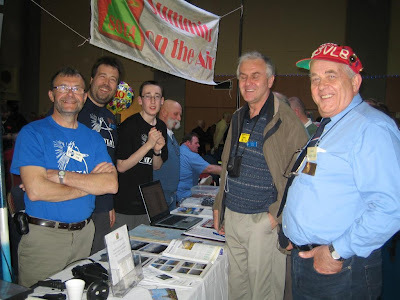 Summits On The Air also had a stand where I was able to chat about WOTA with Tom M1EYP and his son Jimmy M3EYP, and meet Phil G4OBK who is the top activator in the Wainwrights On The Air (WOTA) scheme (and the only one so far to have earned a certificate.) Olga took this picture but unfortunately she caught me just as I blinked! It was a very enjoyable day, but now you'll have to excuse me, I have a large bag of components to sort out! Been quite a while since I last went to a Norbreck Rally, which was with my late father probably twelve or so years ago. Great to see Tom Reid, M1EYP and his son in the last photo. Tom, Chris Brand and myself got the British DX Club's Manchester meetings off the ground in the 1990's. That was in the days when I lived near Oldham and worked in Manchester, before the move 'across the pond'. I always found Tom's enthusiasm for radio and DXing very infectious.